The one-of-a-kind kimonos shown on our Vintage Japanese Kimono pages have been decorated with a wide array of traditional techniques, each with distinctive characteristics that encouraged imaginative imagery. Japanese artisans have used embroidery to create opulent effects on kimono -- especially lavish wedding kimono. 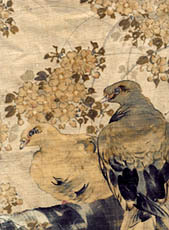 With silk floss and variations on the "long and short stitch" or satin stitch, hira-nui, they have built up entire motifs, as in the feathers below. Some forms have even become three-dimensional. 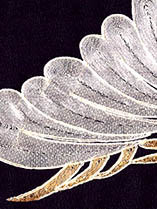 Gold and silver threads are made of foil applied to thin membrane or paper strips which are wrapped around silk threads. These metallic threads cannot be stitched through the silk fabrics, so they are traditionally "couched": laid on the fabric surface and stitched down with fine silk threads. 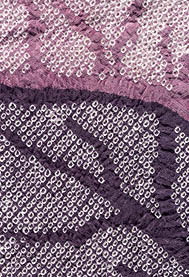 Motifs may be outlined with gold couching or entire motifs may be formed with metallic yarns placed side by side. The technique is called shusu. The photo below magnifies the gold metallic threads considerably. 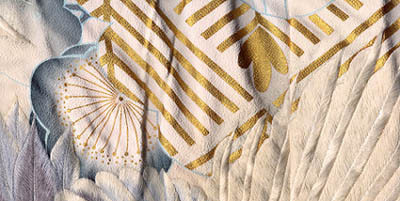 With a dyeing technique invented in 17th century Kyoto, a mixture of rice paste and soybeans has been used to draw delicate free-hand linear motifs on white silk. An artist squeezes the paste through a funnel-shaped container much like a small pastry bag (below left). After this paste resist dries, he paints the areas on both sides of the lines with brushes, using the desired dye colors. Delicate shaded effects can be created, and the rice paste outlines prevent the dye from seeping into surrounding areas. Even broad expanses of the background color are dyed in this manner -- by hand painting. The most characteristic features of kimono ornamentation made in this way are subtle color gradations and narrow, flowing light lines that outline the motifs. Yuzen dyeing. Drawing rice paste lines at the left; painting in dyes above. Norio Yamanaka, The Book of Kimono, Tokyo, 1982. For areas of wide, regular repeats, artists may apply their rice paste through intricate stencils with squeegees. Then after the paste has dried, they apply their colored dyes with brushes. When all of the painting is finished, the worker steams the kimono silk to set the dyes, and washes out the rice paste. Because of the time involved and the artistry required, yuzen dyed kimono have always commanded high prices. They were often commissioned by special clients. These fabrics are produced with stencils. Rice paste is pressed through the elaborately cut, heavy, oiled stencils onto the fabric; then after drying, the fabrics are immersed in the dye pots. This process has often been used with indigo blue on cotton for summer yukata kimono or for futon covers. Sometimes wax has been used instead, as in batiks made elsewhere. Sometimes, along with colored dyes, gold or silver metallic foil is applied to the fabric surface, creating lavish effects. Rice paste is first applied to the fabric in design areas -- either drawn freely (as at the right), or stenciled (as below). Then metallic leaf is pressed onto the partially dried rice paste. The foil falls away in surrounding areas. 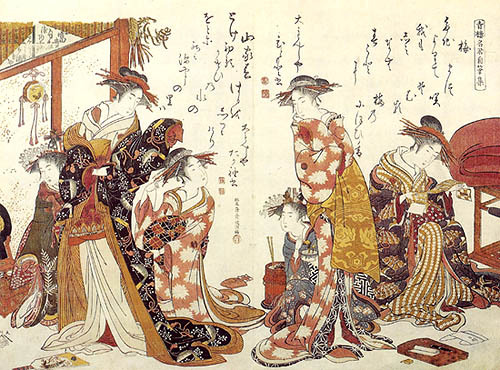 In the past, surihaku decoration was widely used on dramatic Noh theatrical costumes, and its use continued on lavish formal kimono and ceremonial uchikake wedding kimono. These fabrics are tie-dyed. Most often, areas are patterned by tightly wrapping tiny sections of the light-weight white silk with thread. When the fabric is dyed, the wrapped areas remain white, forming a pleasant, slightly irregular repeat pattern of tiny circles. An entire surface covered in this way is called kanoko shibori. The fabric may be allowed to retain its characteristic puckered surface. 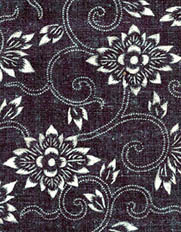 Shibori techniques can also be produced by clamping, stitching or folding the fabrics in various ways to produce unusual patterning. 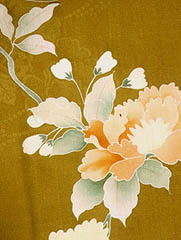 Free-hand painting with indelible inks and brushes is also a time- honored Japanese method of fabric decoration. It appears on kimonos, but even more frequently on the pictorial linings of men's short black haori jackets. These ikat fabrics are made by selectively binding and dyeing parts of the warp or weft threads, or even both, before the fabric is woven. It is an arduous and exacting process. 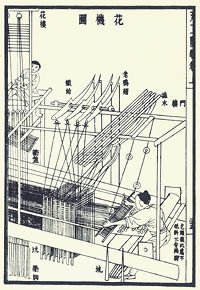 For either silk or cotton fabrics, the threads are stretched on a frame (below), selected design areas are bound, then the hanks of bound threads are immersed in the dye pots. Kasuri weft threads on a warping mill. Jun and Noriko Tomita, Japanese Ikat Weaving, London, 1982. For warp ikats (as shown below), it's the warp threads that are bound and dyed. The fabric is woven with plain wefts, as all of the patterning is in the warps. 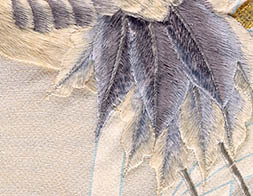 The irregular, feathery design outlines are a characteristic feature, where the dye seeps under the bindings slightly. In contrast, vertical pattern lines are crisp and smooth. For weft kasuri, more juggling is possible. It's the wefts that are bound selectively and dyed, and the weaver has a little freedom in positioning the dyed pattern areas exactly during the weaving process. This makes quite complex motifs possible. It presumes, however, that the bindings were done with much care and precision. Fabric ornamentation with elaborate weft-ikat motifs is known as "picture kasuri," or e-gasuri. Sometimes the warps are printed or painted before the final weaving process. 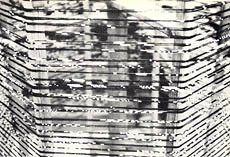 The fabric below appears to combine techniques. 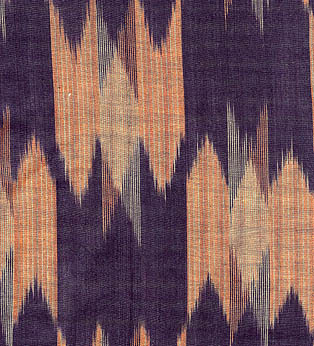 For meisen ikat, both warp and weft are bound and dyed, as in the indigo-dyed cotton yukata below. Distinctive effects are produced by combining or crossing the resisted areas. Historically draw looms (as at the right), and more recently jacquard looms, have been used to produce a variety of weaves with stunning tone-on-tone patterning. Damasks, brocades and twills are among the structures employed. 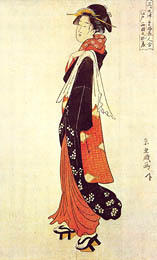 White wedding kimono often exploit the possibilities of these techniques, and obi designs have employed an even wider range of complex weaves. Brocade designs have been woven with contrasting colors or materials such as metallic or lacquered threads. 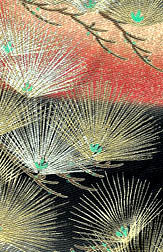 The decorative techniques have been combined in numerous ways by inventive kimono artists to create stunning, one-of-a-kind works of textile art. The distinctive effects of these have been copied and mass produced in recent times by either screen printing or mechanized roller printing to produce garments for a much wider public and for export.